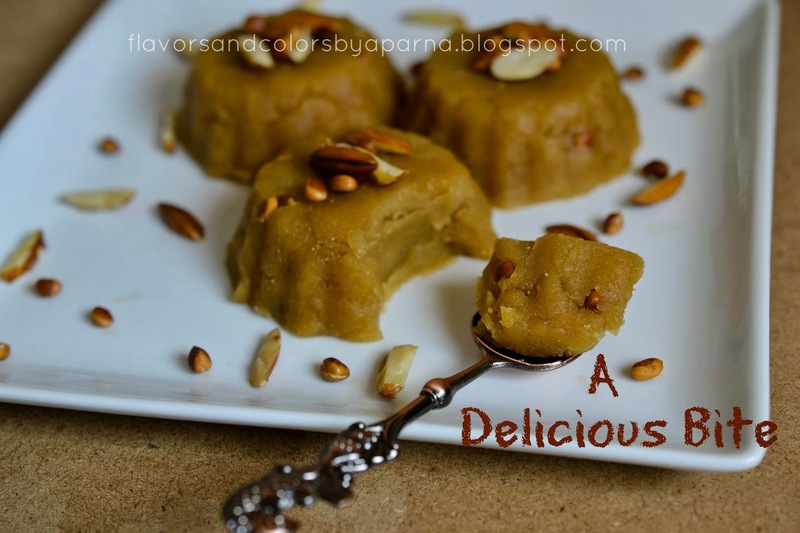 After the recipe of wheat flour dosas, I was reminded of a sweet known as "Atte ka Halwa". I have prepared this sweet many times as its so quick and with simple steps it just gets done in 15 minutes. It was when "S" posted this dish on a food group about a year back, I tried it for the first time. The recipe she shared was inspired from Divine taste. 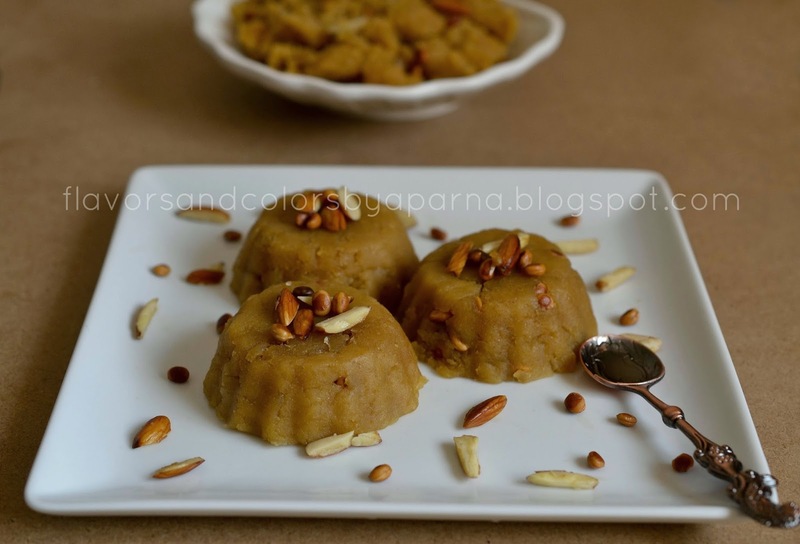 This sweet dish, also known as Karha Prashad is prepared and served as prasad in langhar [ free community dining room, a feature of all Sikh temples] during gurudwara programs. Having said to be full of protein and rich in iron, this dish when prepared in ghee tastes so delicious that you will be tempted to go for 2nd and 3rd servings. I prepared this sweet once again on occasion of Holi today. The below recipe is a bit variation from Anushruti's recipe in terms of proportion of ingredients used. 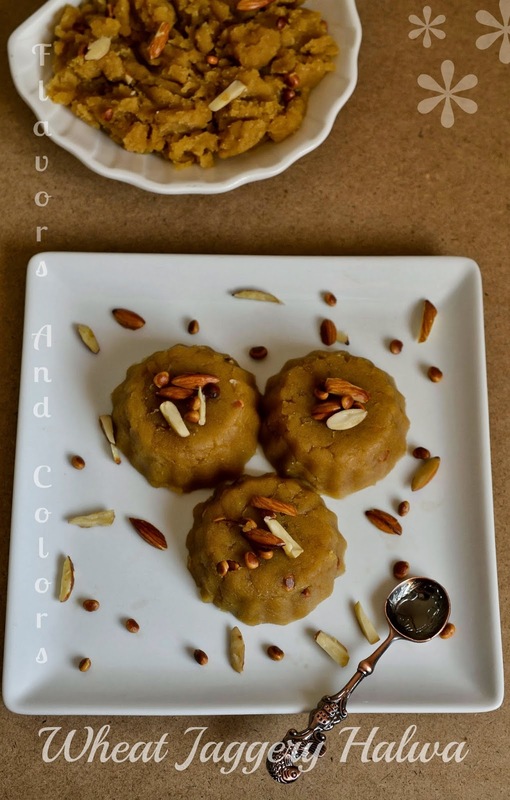 I pass my Holi wishes to all my readers, friends and take this opportunity to share this sweet dish recipe with you all. Meanwhile, dissolve the jaggery in warm water. Once the wheat flour attains the required golden brown color and the raw smell disappears completely, add the jaggery mixture to this pan and stir it. Mix until the mixture turns smooth and come together. Cook for a minute more, add cardamom powder and mix gently. Switch off the flame and garnish it with roasted charoli and silvered almonds.